Make your vehicle amazing with the most beautiful light display parts held with us.Choose yourself with a wide range of lighting options by getting the most brand leaders among us. Driving & Fog Lights are perfect to drive in fog, stormy weather, heavy rains and moonless nights with confidence. Our selection of stylish Driving & Fog Lights provide extra illumination and are great for both bad weather as well as normal driving conditions. These Driving & Fog Lights are available in a variety of styles and finishes that help you make a unique style statement. Give your vehicle that distinctive off-road look while also adding lighting for those off-road expeditions when civilization is nonexistent. Work Lights are great for off-road vehicles as well as construction and industrial vehicles. Built tough with Fiberglass reinforced plastics and cast aluminum. These work light evenly illuminate the surrounding area. Choose from all the best name brands. Headlights upgrade the face of your vehicle with clear style and extreme range. Whether you're after projector or euro headlights, we have the updated look and new technology you need. And, our headlights are custom-made to fit right with ease. LED lights are a perfect replacement for any broken or faded factory Taill lights, Third Brake Lights or Side Markers. L.E.D. lights add custom look to your truck, suv or car & have a wide variety of styles including Crystal Clear, JDM Black, Red Clear, and Smoke Lens. Side marker lights turn your daytime runners into instruments of enhanced looks. Ending the cycle of amber lights on your vehicle, these side marker lights fit directly in the factory positions. And, our side marker lights match your other light upgrades. Cab Running lights are mandatory factory equipment on big rigs, one ton and above. The two outside lights are known as clearance lights, the three inner ones as marker lights. Combined, they give oncoming traffic a visual fix on the vehicle, offering additional safety. The kits come complete with lights, wire harness, quick splice connectors and a dash mount panel with toggle switch plus indicator light. You can flash them just like a big rig. 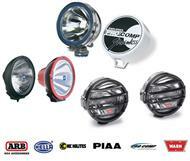 HID Lighting is currently the most advanced development in the field of motor vehicle lighting systems. Xenon has decisive advantages over the light of conventional light-bulbs; its improved light output makes the road brighter and illuminates a wider area. The daylight-like quality of xenon light is especially welcomed by the human eye. Drivers get tired slower and driving becomes more relaxed. This means an enormous gain in safety and driving comfort. Strobe Light Kit uses the latest technology to bring ambulance-power strobes to your vehicle in a compact package. Because of its extreme brightness, please check local laws before using this kit on the street. Corner Lights adds clean, modern Euro style to your front end. No other upgrade offers such a dramatic effect for such little time and money. In just a matter of minutes you can easily add a clean, modern look to your front end. Our clear corner and bumper lenses easily replace your factory amber lenses for hi-tech Euro style that'll get your vehicle noticed. Set your vehicle apart from the competition with a custom underbody lighting kit. Choose from unique styles. LED or Neon Underbody Kits are the brightest, most durable kits, and include a special translucent control module that lets you select and preview 10 different flashing patterns. Be sure to pick up the optional keychain remote kit so you can turn your kit on or off from anywhere.